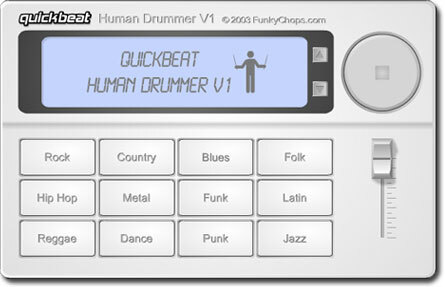 DOWNLOAD NOW - The Quickbeat Human Drummer is perhaps the easiest drum machine in the world. Just click-and-play... no sequencing, programming, tempo change, etc. It's the simple way to turn your Windows (or Mac) computer into a human drummer. Quickbeat was designed for guitar practice and anytime jamming. You can find more information, samples and download Quickbeat here.